A fire at Interstate Underground Warehouse is costing business owners who used the caves. KANSAS CITY, Mo. — Many tenants at Interstate Underground Warehouse still don't know how much damage they could be facing after a large fire broke out Saturday afternoon. "It's how I pay my rent here and my rent at home," said business owner Carie Cave. Cave's mushroom business, Cave Cultivated Creations, is inside the caves at the warehouse. And yes, she acknowledges the irony. "My name is Carie Cave and I feel like I was made for this," she said. All of the organic mushrooms she and her partner grow could be ruined. Cave and many other tenants gathered outside the cave entrance on Monday as fire marshals continued to investigate, but they weren't allowed to go back in. "It's killing me. It's literally $1,200 a day. I got a Peterbilt down there that I make my living with and I can't go in there and get it. So, no work for me today," said Kenneth Cassway, who operates his own trucking company. Cave said if her crop is ruined she'll lose around $1,500. A state inspector and a representative from the health department were on scene. A structural engineer went inside the caves and will report back. Officials haven't said if the fire started inside or outside the caves. The owners of Bird's Botanicals, a popular orchid nursery, said they've noticed people burning trash above the caves. Those reports have not been confirmed yet. The owners told 41 Action News a previous fire around Oct. 9 shut them down and they haven't reopened since. They said the fire got in through the ventilation system both times. Other tenants also said this isn't the first time a fire has broken out at the caves. 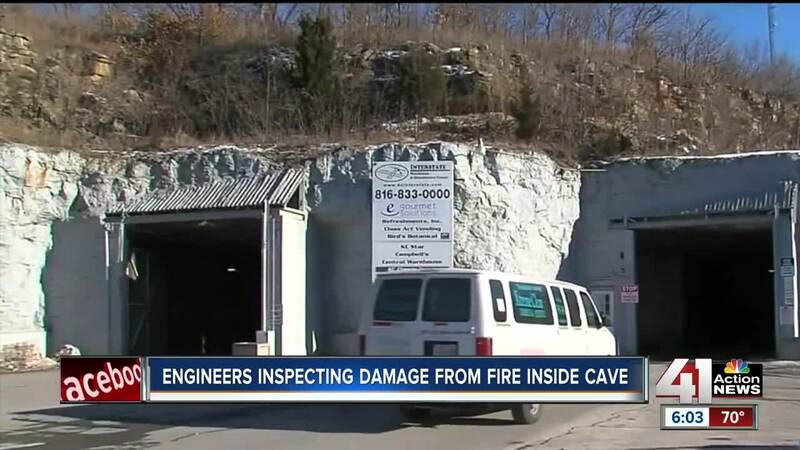 KCFD said there have been fires at the caves in the past, and are looking into the tenants' complaints. "We have giant chunks of limestone falling from the ceiling, which is a dangerous situation, which is why we pulled everybody out," said Deputy Chief Jimmy Walker with KCFD. They are no reports of missing people. A couple of people were treated for smoke inhalation. Cave said she's glad no one got seriously injured and that the fire didn't happen during the week when more people are at the caves. "There's nowhere to get out except the front door," Cassway said. KCFD said they'll investigate for another day. Tenants have heard they may be able to go inside on Tuesday.